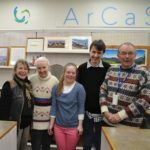 The Arran Cancer Support Trust (ArCaS) store located at the ferry terminal will reopen next week following a closure for some essential works to be completed and a redesign of the shop. With a grand reopening planned for Monday January 21, the store will now feature a new floor, an updated layout and once again be able to receive donations of good quality items for resale. Funds raised from the sale of donated goods goes towards providing services for cancer patients on the island which includes transport to and from hospital appointments on the mainland and on Arran, free ferry travel for patients and a companion, and complementary therapies and counselling. Established in 1989, the well supported and cherished charity shop has been located at the pier premises since 2001 and is open from 11am to 4pm from Monday through to Saturday.